“That’s not fair!” These were the words I uttered as a child anytime I felt that someone or something had unjustly slighted me. “Life isn’t fair,” my parents would tell me, which always seemed an unsatisfying solution to the real world problems of a spoiled kid. Flash forward a few decades, and I find myself doing a PhD motivated by that exact question: why isn’t life fair? Certainly, we can point to many unfair aspects of modern and ancient human societies—racism, sexism, or feudalism, for example—in which some members of society benefit more than others. In these cases, the criteria for being a privileged member of society are arbitrary: a descendent of the royal bloodline rules a kingdom based entirely on birthright with no consideration of their abilities as a leader. The inheritance of socioeconomic status from parents means that children in our society don’t all start on an equal playing field, regardless of the innate abilities of the child. It is clear that humans are familiar with an unjust life, but is this specific to humans? Is “life not fair” for other animals as well? The short answer is yes. The composition of a single hyena clan. Notice the difference in the sizes of high-ranking and low-ranking matrilines. High-rankers get priority while feeding and reproduce more quickly and successfully than low-rankers. Figure from Holekamp et al. 2012. Social animals usually live in groups structured by a dominance hierarchy, where some members of society get priority when it comes to feeding or reproducing. This means that a low-ranking female paper wasp may never get to lay eggs, or that a high-ranking hyena may eat her fill before her lower-ranking sister gets to feed. 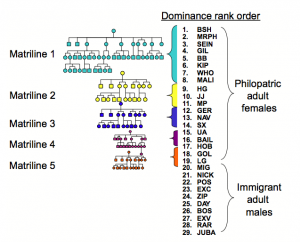 Some of these hierarchies are organized based on size or fighting ability, where the dominant animals earn their status through physical prowess. In the societies of many primates and spotted hyenas, however, social rank isn’t earned; instead, it’s inherited. Although this inheritance is not mediated genetically, this means that the dominant female hyena gets to be the queen of her clan simply because of who her parents were. Sound familiar? A current project of mine is focused on understanding what forces promote unfair societies in the animal kingdom. I’m using spotted hyenas as a model organism to answer these questions because their social standing is inherited and their societies are dramatically unfair. In a hyena clan, a high-ranking hyena can easily steal food and other resources from a lower-ranking group-mate. This means that hyena that hunts and kills a gazelle may lose it to a higher-ranking individual without getting a single bite, even if the higher-ranking hyena is smaller than the animal who killed the gazelle! Rank in spotted hyenas has a large effect on fitness, and higher-ranking (and better fed) individuals reproduce around twice as much as lower-rankers (Holekamp et al. 1996). Clearly, low-rankers would stand to gain a lot by attempting to improve their social standing, but rank changes in hyenas are extremely rare. Fortunately, long-term research from the MSU Mara Hyena project has yielded a large dataset that allows for the study of such rare behaviors. Now, using nearly thirty years of data on multiple hyena clans, I have identified instances of rank change in order to understand why they are so uncommon. An example of coalitionary aggression. The two smaller hyenas on the left are displaying aggressive postures (tail bristled, ears cocked forward, head high) while the larger hyena on the right displays submissively (ears plastered back, mouth open). Why don’t low-ranking hyenas challenge the status quo and attempt to improve their rank? It is possible that they don’t have enough allies. In societies where social status is inherited, it is common to see coalitionary aggressions from multiple individuals to a single target. These aggressions are thought to either strengthen the status quo (‘conservative’ coalitions, directed from high-rankers to a single low-ranker) or challenge it (‘revolutionary’ coalitions, directed from low-rankers to a single-high ranker; Bissonnette et al. 2015). 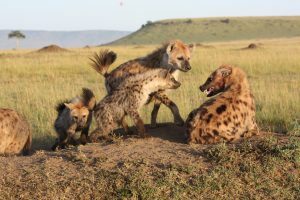 If coalitions are the key to maintaining or challenging the status quo, then low-rankers may rarely have the chance to challenge high-rankers because high-ranking hyenas have more social allies. High-rankers reproduce more quickly than low rankers and thus have more close kin with which to ally, and high-rankers also have mutual direct interest in maintaining the status quo (Holekamp et al. 2012, Smith et al. 2010). If rank change hinges on coalitionary aggression, we expect to see the instances of rank change associated with cases where a high-ranker loses many of its allies, thus exposing itself to revolutionary coalitions. Alternatively, it is possible that low-rankers rarely challenge the status quo because they suffer a cost by doing so. This cost could be punishment inflicted by the challenged groupmates or could be due to subtler costs of living in unstable conditions. Dominance hierarchies are thought to exist because they bring stability and decrease conflict within a group (Schjelderup-Ebbe, 1922). Thus, challenging the status quo should carry costs associated with increased conflict. If the direct costs to challengers are deterring hyenas from challenging the status quo, we expect to see elevated amounts of wounding and high levels of stress hormones in hyenas that are involved in rank changes and unstable hierarchies. Even if we detect costs incurred by hyenas attempting to improve their social status, they will have to be weighed against the rate of success and the benefits gained by hyenas that successfully improve their rank. Hopefully, this research will begin to shed light on the forces that maintain social inequality in animal societies. 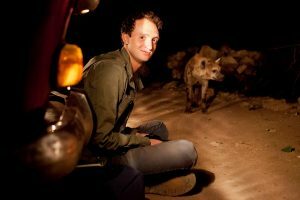 Hyena societies are similar to many primate societies, and are thus wonderful models to use to understand the inequality that exists throughout the animal kingdom. Viewing human inequality in the context of evolutionary patterns can help us understand why life isn’t fair, both for us and for our animal relatives. Bissonnette, A. et al. 2015. Coalitions in theory and reality: a review of pertinent variables and processes. Behaviour 152:1–56. Holekamp, K. E., L. Smale and M. Szykman. 1996. Rank and reproduction in the female spotted hyaena. Journal of Reproduction and Fertility 108:229–237. Holekamp, K. E., J. E. Smith, C. C. Strelioff, R. C. Van Horn and H. E. Watts. 2012. Society, demography and genetic structure in the spotted hyena. Molecular Ecology 21:613–632. Schjelderup-Ebbe T. Beitrage zur Sozialpsychologie des Haushuhns. Z Psychol 1922, 88:225-252. Smith, J. E. et al. 2010. Evolutionary forces favoring intragroup coalitions among spotted hyenas and other animals. Behavioral Ecology 21:284–303.